It's not great, but it's not horrible, either. 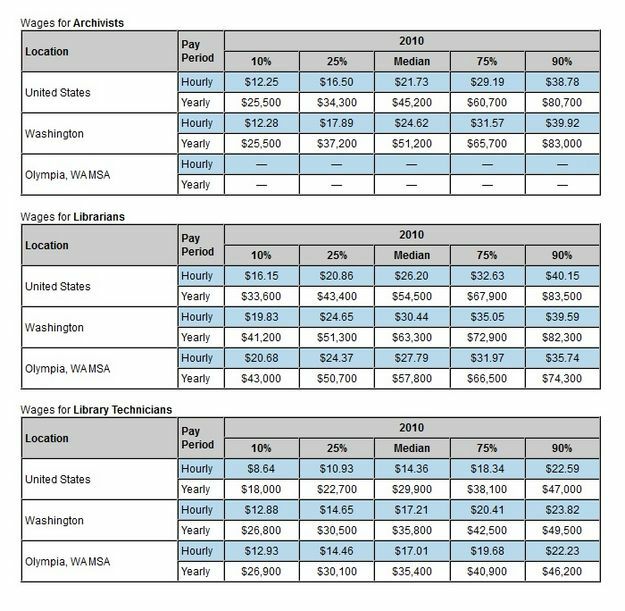 The average wage for an Olympia area librarian in 2011 is $20.39 per hour, or better than the living wage necessary for a two-adult, one child household, but worse than the living wage necessary for a two-adult, two or more children household. This is notably better than the living wages for a librarian in Tucson, Arizona, where the average librarian's wage is $17.75, thereby only sufficient to cover a two adult household without children. Both of these living wages are relative to the local economy supporting them. As a general trend, Olympia has better living wages than Tucson does. Tucson's minimum wage does not meet the minimum (single person) living wage, while Olympia's does, for example. As in any branch of careers, there are more specialized areas that in turn get paid different wages. General trends are that wages for librarians > archivists > librarian technicians. Wages by Occupation and Local Area: Librarians. Archivists, Librarians and Library Technicians. This page was last modified on 3 December 2011, at 16:37.